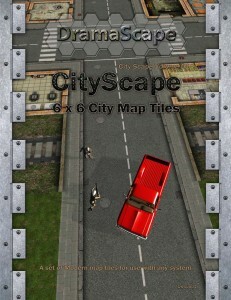 DramaScape has new CityScape 6 x 6 tiles available to help your tabletop look better. CityScape consists of modular 6 x 6 tiles that can be used to build a small city. CityScape uses connective tiles such as roadways, bridges, and railways to build the transportation network of the cities. These lead to destination tiles such as a bar, barbershop, basketball half court, bathroom, café, fountain, gas station, grocery, hot dog stand, Laundromat, motorcycle shop, office, park, squatter’s home, subway entrance, and town art statue. Some tiles are obstacle tiles such as barricades, potholes, and narrow alleyways created by dumpsters that can cause problems in a chase. Construct a transportation system and a town for today’s game. Then put away the tiles and you can make a brand new city for the next game!